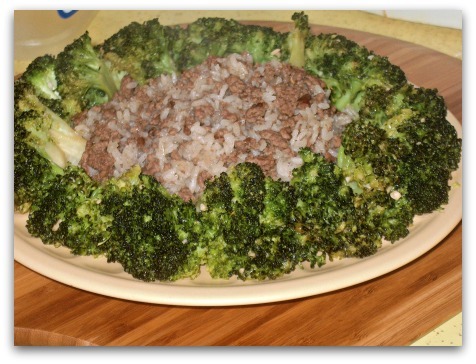 This 5 spice beef rice dinner idea will make quite an impression on your friends and family. It won't hurt to double the quantity. Meanwhile, preheat another big, deep saucepan at medium high heat. Add 2tablespoons oil, garlic, broccoli, ½ teaspoon of salt and ¼ cup of water. Stir to combine. You may occasionally drizzle some more oil if the rice starts sticking to the bottom of the pan. Add 1 tablespoon at a time. It may need more or less than what this recipe calls for, depending on your pan. I love the combination of the 5 spice and beef. You can definitely replace it with ground chicken or turkey. I tried to use either one of them before. It may need a little more oil if you use the poultry. Using freshly cooked rice will make this dish mushy. You can feel the big difference of the texture.